Goodbye Seattle summer. You weren’t here very long, but I enjoyed every second of your stay. It was so much easier to get out of bed in the morning with your golden rays shining in through my white curtains. My golden shoulders and the freckles on my nose will remind me of you and the time we shared on the deck reading books and drinking ice tea. And although you are now gone and the familiar grey skies have returned to cast a darker light on the Emerald City, I was pleased to discover you left a few little treasures behind to ease the transition into fall. Like the juiciest watermelon I’ve had all year and the bumpy purple heirloom tomatoes on the counter; those two will happily be enjoyed with a sprinkle of coarse salt. And the figs. 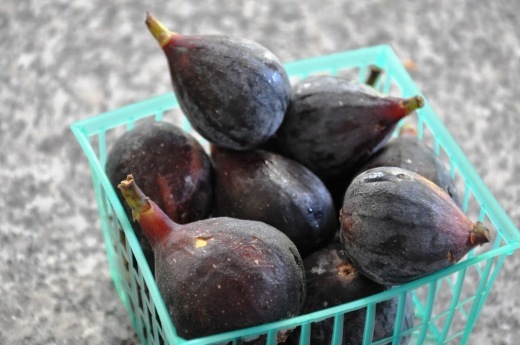 The sweet, tender figs. With crunchy seeds and soft flesh, dark purple skin and blushing insides, they are truly a gift. Roasted with fresh thyme, salt and pepper, honey and balsamic, the figs melt into their own luxurious sauce. 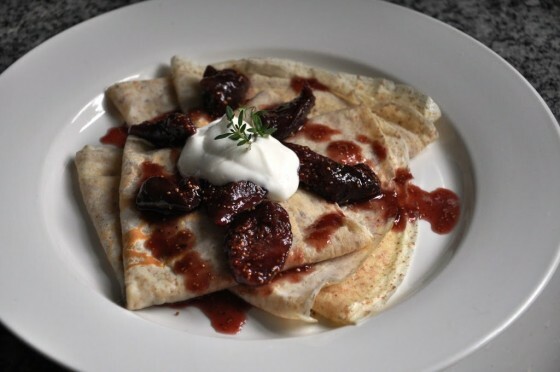 Flax-speckled crepes make the perfect pedestal for the sweet tart harmony of late summer fruit, along with a dollop of a rich, tangy crème of yogurt and sour cream brightened with lemon zest. So, with a proper farewell to the sun and welcoming of autumn, I feel ready (and hungry) for the cooler months ahead. The figs are excellent on pizza, with camembert cheese, proscuitto and argula salad. Or on yogurt. On on roast lamb. Or in a panini. Yummm. Roast the figs. Preheat the oven to 400F. In a bowl, combine the honey, thyme, salt, pepper, vinegar and olive oil. Add the figs and toss gently to coat. 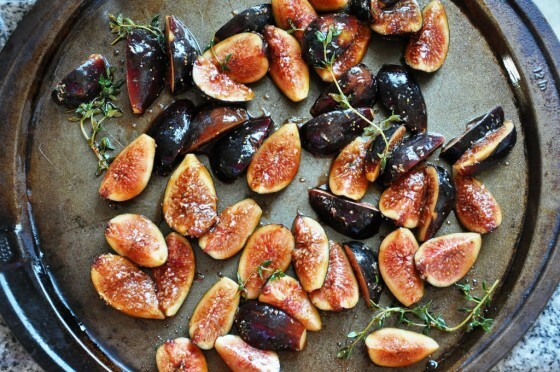 Spread the figs out on a baking sheet and roast for 20 minutes, or until the sauce is syrupy and the figs are caramelized and soft.Scrape the figs and sauce into a bowl and allow to cool. 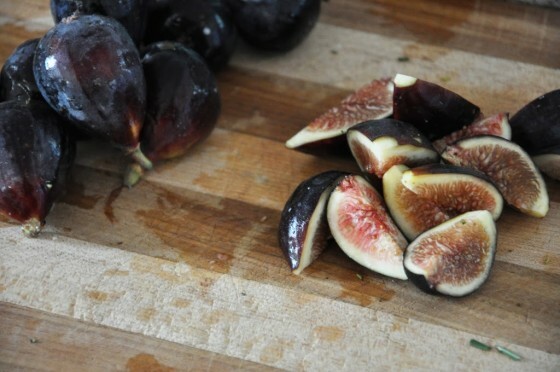 The figs can be roasted up to 3 days in advance. Make the crepe batter. 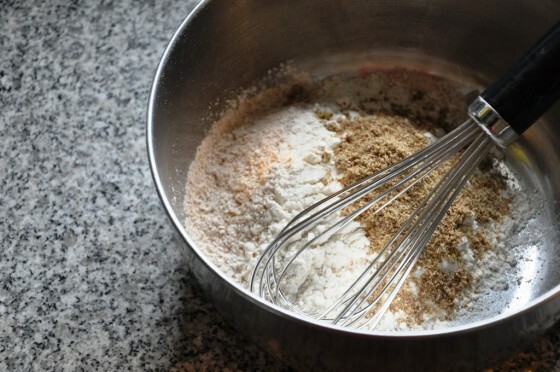 Whisk together the flours, flax and salt. In a separate bowl, whisk together the eggs and milk, then slowly pour the liquid ingredients into the dry ingredients while whisking vigorously until the mixture is smooth. Cover and refrigerate for at least 30 minutes and up to three days. Make the crepes. Heat a small nonstick skillet or crepe pan over medium heat, then coat with the tiniest amount of butter or oil (If you grease the pan too much the batter won’t stick to the pan in an even layer). Pour a scant ¼ cup of batter into the hot pan while simultaneously tilting the pan to swirl the batter into an even layer. Cook for about 45 seconds, until the edges are slightly crisp and the bottom is lightly browned. 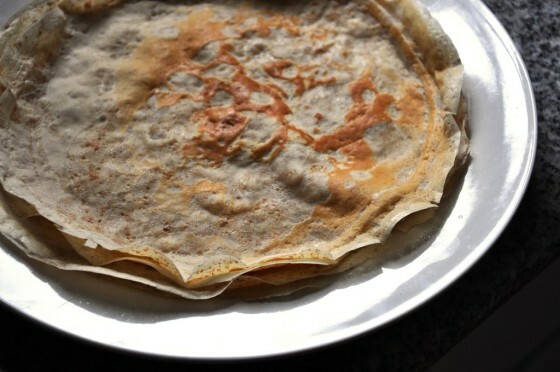 Use a spatula to loosen the crepe, then flip it over with your fingers and cook on the second side for 20 seconds until it is lightly browned. Remove the finished crepes to a plate. The cooked crepes can be refrigerated for up to three days or wrapped in plastic wrap and frozen for up to two months. Make the crème. Whisk together all the ingredients until smooth, then cover and refrigerate until ready to serve. The crème be made up to three days in advance.